Accompanying our annual Walk for Hope, the Race for Steak is a USA Track & Field Certified run held in Raleigh, North Carolina with a timed 5k route. 100% of the money raised by participants directly funds local mental health research at the UNC-Chapel Hill Department of Psychiatry. And, just as critically, it helps call attention to the stigma and significance of these often invisible illnesses, which affect as many as one in five American adults. 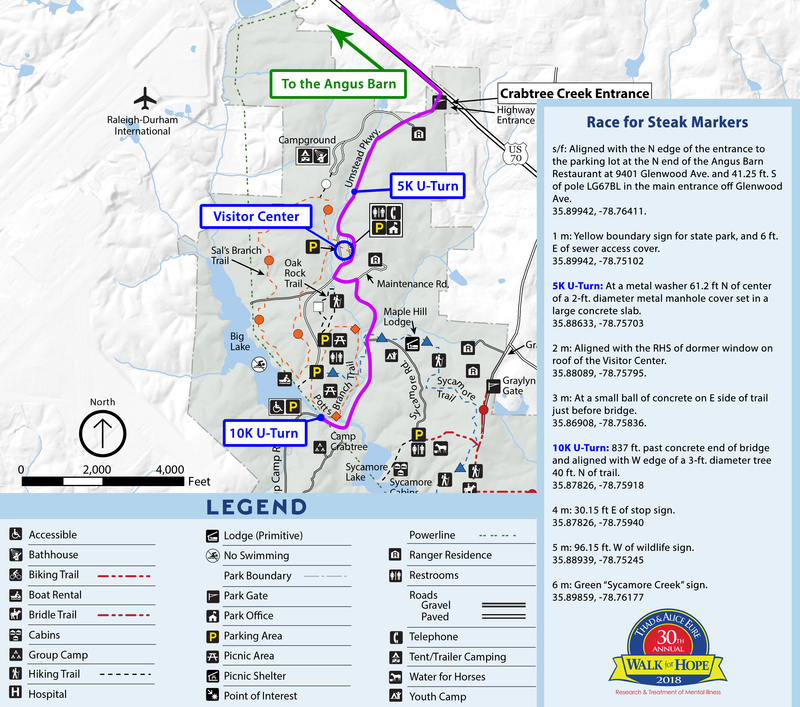 The Race for Steak features a 5k (3.1 miles) route that begins at the Angus Barn on Hwy 70, turns around at the Umstead Visitor Center, and returns to the Angus Barn. Prior to Race Day, participants can register, turn in collection envelopes and pick up t-shirts and event armbands at the Angus Barn. Beat the crowd and save time! We STRONGLY encourage Early Check-In. Run registration opens at 8 a.m. at the Angus Barn (see parking instructions below). To encourage early registration and check-in, ALL Event Day prices increase by $5. The run starts at 9 a.m. sharp. Prizes will be announced for top finishers beginning at 10:30 a.m.
Pre-Registration Cost: August 20 – October 13th at 11:59 p.m. The Race for Steak takes place the same day as the Walk for Hope. It is more than just a community event—it’s a huge fundraiser that directly funds the research and treatment of mental illness. Most of our walkers and runners raise the money they need to participate; in fact, the average participant in the race raises at least $150. To learn more about where these fundraising dollars go, click here. *All children and full-time students who register for the Race for Steak will receive an armband for the post-Walk/Race celebration. A team consists of five or more participants. Each member may join their team when they sign up online. A team can include both walkers and runners. Please make sure to give your team members the Team Name or Team Captain’s name to make sure your members sign up on the right team. Raffle tickets are available for you to sell. They’re available at no cost to you, and the tickets you sell can be used towards your registration fee and fundraising goal. You can pick them up from the Foundation of Hope office at 3108 Glen Royal Road in Raleigh or at the Angus Barn office. If you’d like to enter the raffle yourself, you may also purchase your tickets from us. Tickets are 1 ticket for $1; 6 tickets for $5; and a roll of 25 tickets for $20. Sell (or buy!) as many as you’d like! You don’t have to participate in the Walk for Hope to win! Call 919-781-9255 if you’d like to enter the drawing without registering for the event. FREE Walk shuttles will be available 7 a.m. to 3 p.m.
Food: Breakfast items will be provided. 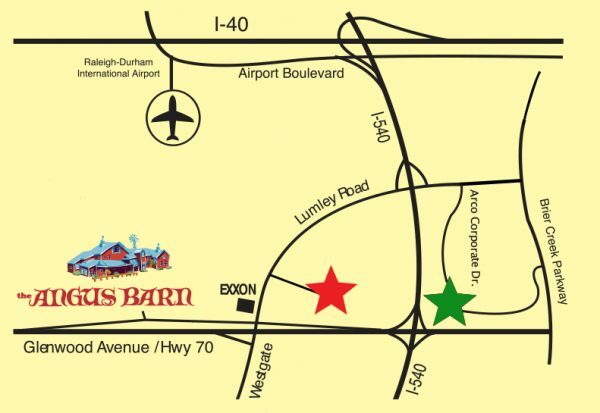 All registered participants are welcome to join the post-Walk for Hope/Race for Steak Celebration at the Angus Barn, with kids’ activities, great food, music and more. Strollers: If you bring a child, remember to bring a stroller, infant carrier, baby jogger or wagon.